Salt Dough Ornaments that my Family Made. So with money being really tight and with the giving mood in the air, we decided to make ornaments for our family. We hate showing up with nothing in hand to give to family and we are so broke that we came up with salt dough ornaments. It was fun the girls got to help and we all had a good time. Hopefully our family loves them as much as we do. That was last year. I did it this year as a ornament decorating party and invited the whole family over. 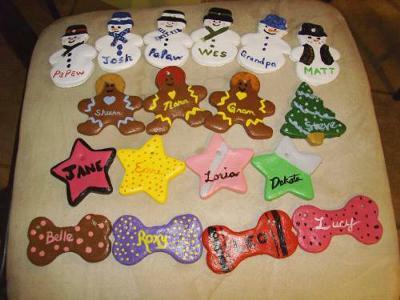 I made 3 batches of dough and came up with 74 ornaments to paint. I had a paint kit with about 32 gloss colors from Wal-mart that I used and a paint brush kit also. The family LOVED it! I had snacks on hand and we just painted ornaments for a few hours. Here is the recipe I've been using for a few years! Directions: In a large bowl, mix table salt and flour together. Gradually add 1/2 cup of water and mix to desired consistency. Knead the dough on a flat surface, adding a few more drops of water as needed (but not making it too moist). Once the dough is made, you can divide it up into small portions to roll into 1/8" thick pieces with a rolling pin. Use cookie cutters to cut out a variety of shapes, and place the shapes on wax paper or other surface to dry. If you want to make hanging ornaments, pierce the dough through with a toothpick while it's wet. Allow the shapes to dry for a day or two, turning them over periodically to speed up the drying process. You may need to re-pierce the hole several times during the drying process. After the shapes dry, you can use a fine grit sandpaper to gently smooth any rough edges. Instead of allowing the dough shapes to air dry, you can bake them in the oven at 200 degrees F until hard. Baking times varies depending on oven and dough thickness. Make sure the dough is completely baked. You can cover the dough with aluminum foil if it starts to darken before completely baked through. * You can store prepared salt dough in a sealed container in the refrigerator for a day or two before using. * Add color to the dough by mixing food coloring or paint into the water before adding it to the flour/salt mix. Alternatively, you can paint the finished baked dough with acrylic paint. * Painted objects should be sealed on all sides with polyurethane spray or clear varnish to make them lasting gifts or keepsakes. These are great. I received one of these about 20 years ago and I cherish it to this day. Each year it has a special place on our tree. I saw on the Today show just this week that the total cost for about 20 of these runs only about $1.00. Thanks Mary for posting the recipe and tips! Join in and write your own page! It's easy to do. How? Simply click here to return to Readers Christmas Card Gallery.